Peter Woodrow is the Executive Director of CDA Collaborative Learning Projects. For nearly a year, Peter has accompanied the Kuleta Haki project providing support to our local partners (RCN J&D) on using systems maps as an analytical tool for better understanding corruption dynamics in the criminal justice sector. In April, Peter shed some light on this process, and updates us now on how both the tool, and techniques for facilitating these types of workshops, have developed since his initial engagement. For the past year and a half, we at CDA have been working with local stakeholders and partners to develop a strategy for combating corruption in the criminal justice system in the Democratic Republic of the Congo (DRC). After completing a broad national level analysis of corruption dynamics, the project focused on Katanga Province in southeastern DRC. As discussed in other blog posts, the main approach has been to establish a local network of people, including judges/magistrates, lawyers and others dedicated to promoting change in the system of corruption in the local criminal justice sector. Click here to see the theory of change for the project. Last April (2016), I traveled to Lubumbashi, DRC to facilitate the development of a systems analysis among the local anti-corruption network with a particular focus on corruption dynamics in preventive detention and police custody. Upon my return, I wrote a blog post to present the systems map and narrative generated by workshop participants. During that trip, I was impressed by the courage, intelligence and dedication of these local citizens, determined to ensure the development of their nation, and convinced that corruption is one element that holds them back. [See: A Systemic Analysis of Corruption in the Criminal Justice System in Lubumbashi, DRC] In this and previous posts, we have been discussing systems maps—in this case, maps of the way corruption works in the criminal justice system (CJS). As noted, a systems map is not an end in itself; rather, it is a tool that enables participants to consider where and how to intervene to promote positive changes. Therefore, systems mapping remains an important step for the project to develop specific action plans for combating corruption in the medium-to-long term. [See: Identifying Leverage Points in Systemic Analysis and Planning for Anti-corruption Action] With these principles in mind, I visited Lubumbashi again in November, 2016 to engage many of the same participants in the April working in a further a process to update the systems analysis and to engage in additional forward planning. The group also developed a new systems analysis of how corruption works among the police in Lubumbashi. It happens that my visit also coincided with a preliminary report from an evaluation process, which provided a further basis for lively discussion. At this critical juncture of programming (mid-term), I would offer two observations since the systems work with the group seven months prior. First, the group found that the core systems dynamics have not changed, although they made a few minor adjustments to the map based on their recent experiences. Second, the group was able to place their own interventions in the map. That is, they could show the places in the system where their efforts are beginning to have an effect, mainly in challenging the dominant acceptance of corruption as “normal.” It was also clear that the group is not yet in a position to confront political abuses of power that lead to preventive detention for purely political purposes. That remains a longer-term objective, but is not feasible at this point. 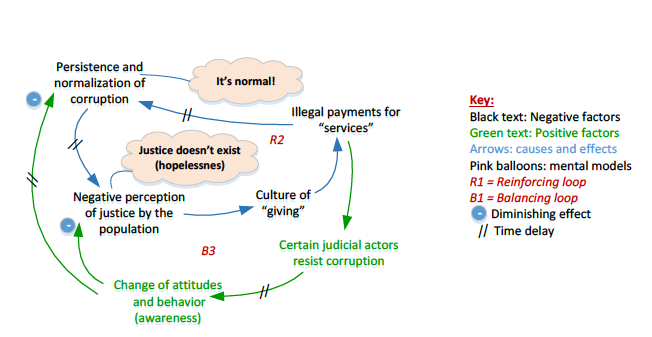 The B3 loop above shows the intended effects of the local anti-corruption network’s work, which assumes that acts of resistance will, eventually, lead to a change in attitudes, which, in turn, will reduce the persistence and normalization of corruption and begin to change how people view the justice system. In essence, the group is working towards a fundamental paradigm shift in the ways that judicial actors and the general public view corruption and its harmful effects. As with any analytic process, the analysis needs constant updating, in order to remain useful. In November, participants agreed that it seemed the project had achieved early successes in changing the attitudes of colleagues through a “prise de conscience” or “awakening” to the harm corruption can have on society and the nation (as shown in B3 loop above). Ongoing monitoring of the project will reveal whether this basic theory of change is valid or not. In addition to updating the systems map of preventive detention and police custody, the group also began the process of analyzing how corruption works in relation to the police. However, members of the network who work in the police were not available for the workshop, so the group had to proceed based on their own basic knowledge of how the police function. They found that many of the same corruption dynamics of the larger criminal justice system also operate among the police—but magnified by an extremely hierarchical culture. Other CJS actors have more latitude to change their behavior, whereas police officers must obey the commands of superior officers, which makes it difficult to resist corruption. On the positive side, if a superior officer decides to curb corruption, those who report to him/her are more likely to comply. Despite these insights, the workshop group was clear that additional engagement with police officers would be needed to validate and enhance the draft map. Plans are in place to create a new subgroup among police colleagues to undertake dialogue and discussion of potential approaches to combatting corruption among police. During this second encounter with systems thinking, the network members appeared more comfortable with the mapping process—and used it effectively to consider strategies for change. Due to time limitations, we have not been able to train them to generate the systems maps on their own. Inevitably, then, the group does not have as much ownership of the systems analyses as they might if they performed the analysis completely independently. That said, overall, updating the map proved useful and the utility of the process was highlighted. Further adjustments will be made going forward, and more updates and learning will be shared! Peter Woodrow joined CDA in 2003 as Co-Director of the Reflecting on Peace Practice Program, and became CDA’s Executive Director in 2013. As RPP Co-Director, he worked with civil society organizations, multilateral agencies and government entities through the Great Lakes Region to apply RPP concepts and frameworks to peacebuilding programming. RPP has been working with systems thinking tools, especially working with causal loop diagrams (systems maps) as an aid in identifying ways to intervene to promote change in a system. He has been supporting the Central Africa Accountable Service Delivery Initiative since CDA became involved in 2012.